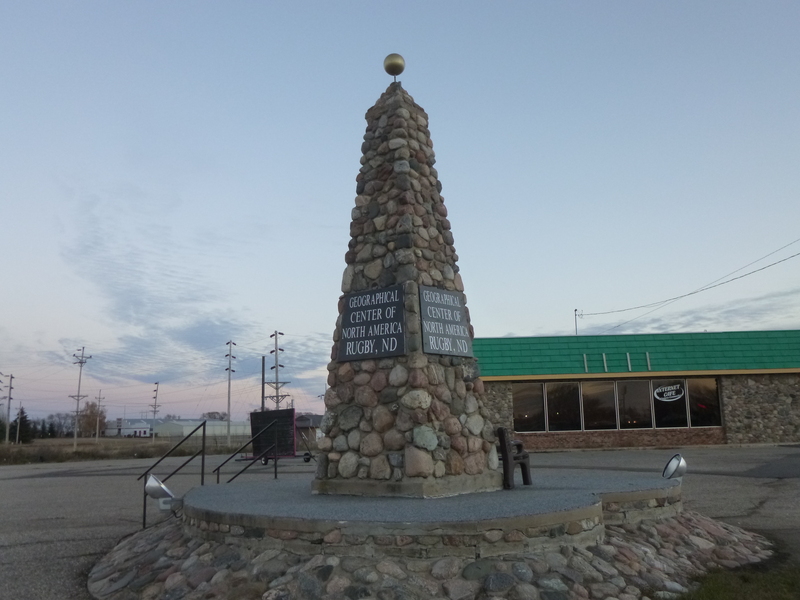 Since I ended up in Bottineau last night, that’s where I started my walking for the day. 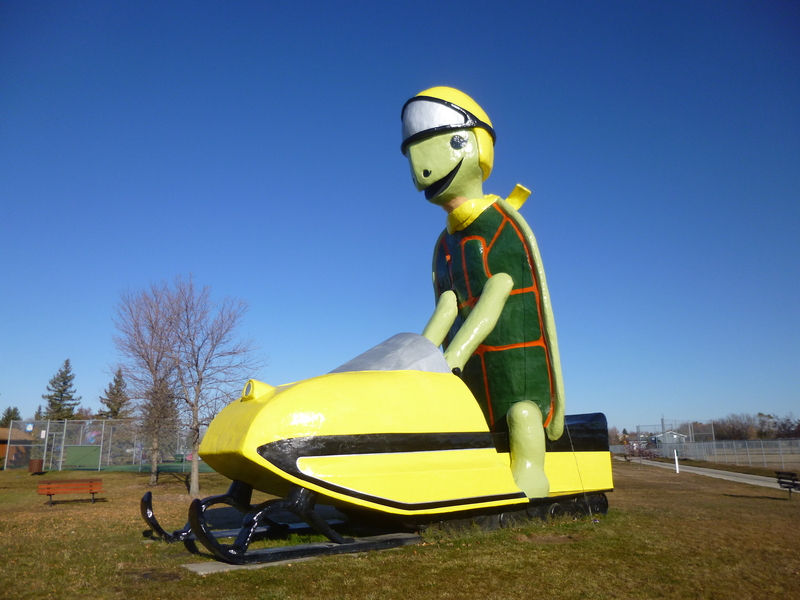 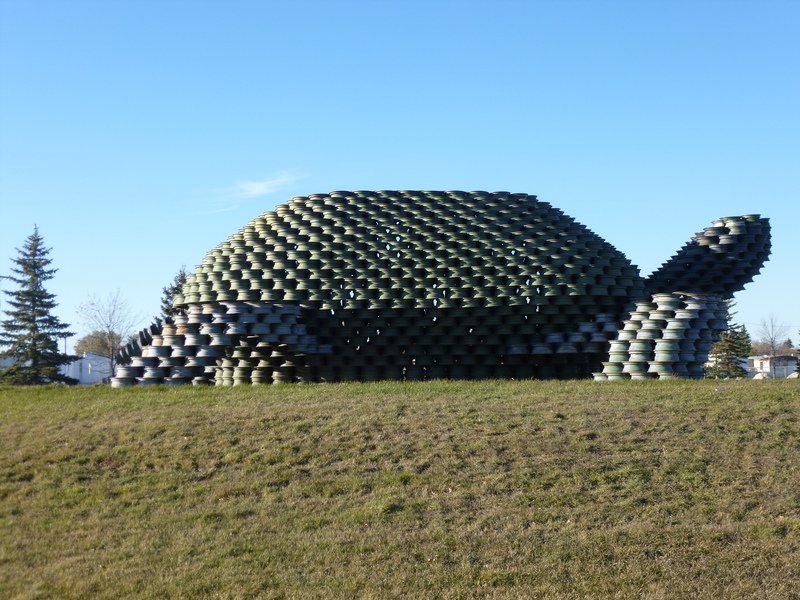 At the city park, I encountered a 50 foot statue of a turtle riding a snowmobile – this town is situated at the base of the Turtle Mountains, and since snowmobiling is a popular winter pastime, they combined the two and made this big statue. 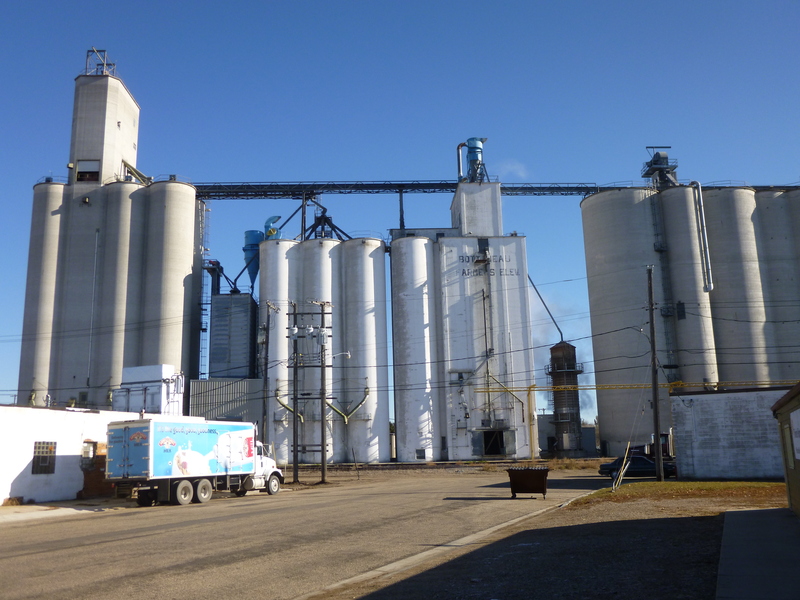 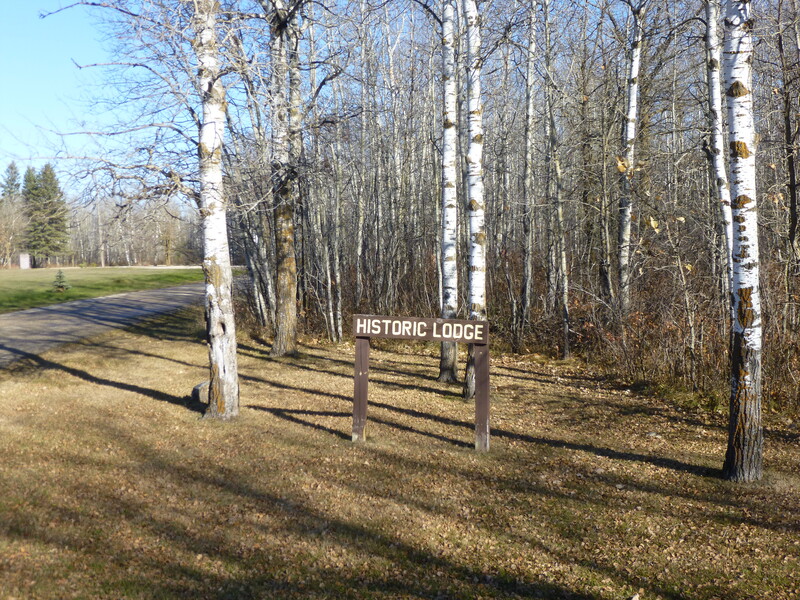 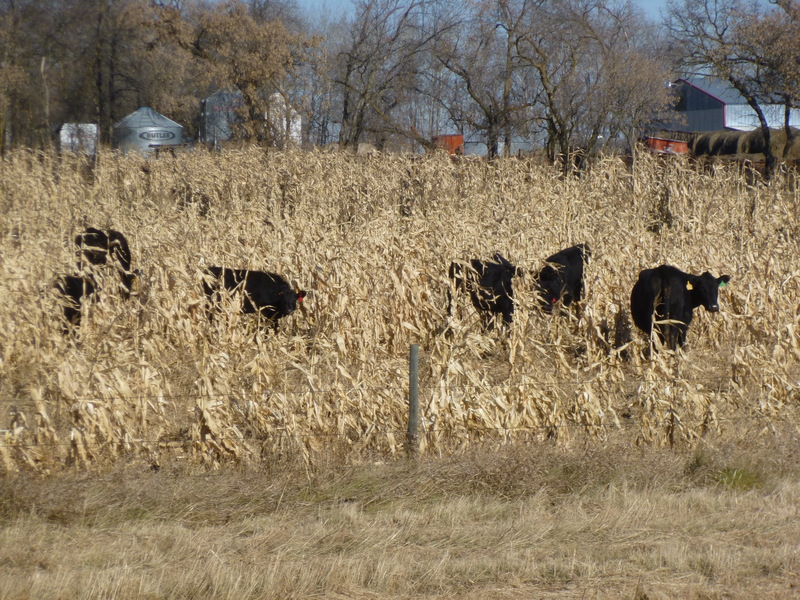 I walked a little over a mile and a half, and walked past a lot of grain elevators that were humming and steaming – it seemed to be a busy area on a Saturday morning during harvest time. 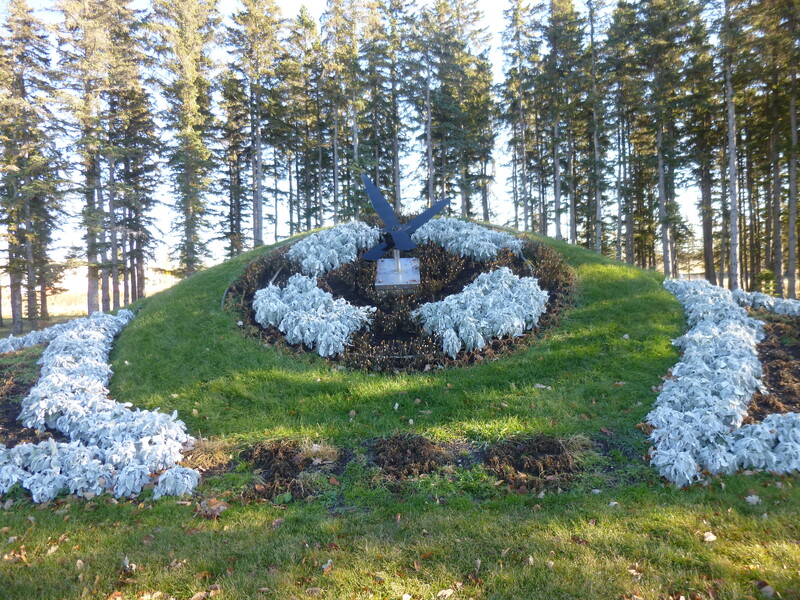 Then I headed north toward the International Peace Gardens that straddle the US/Canadian border. 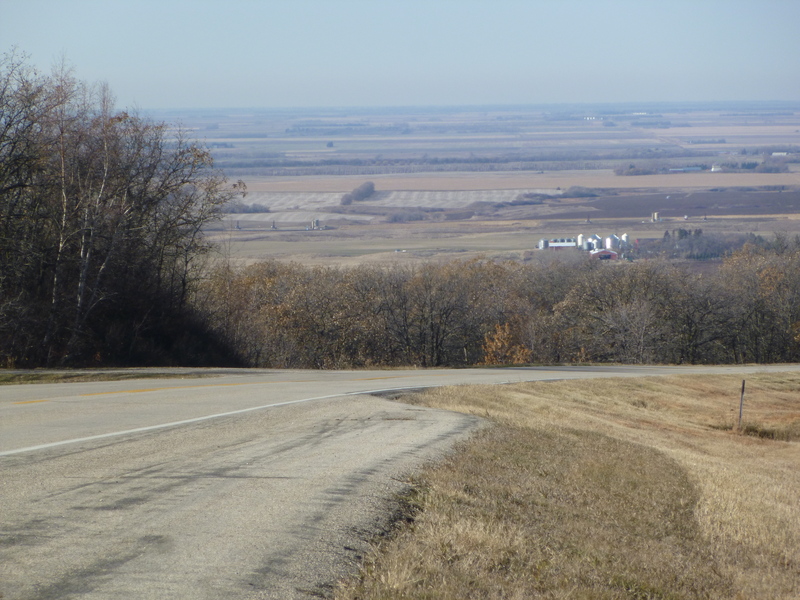 Along the way, I climbed up into the Turtle Mountains, although seemed more like big hills to me! 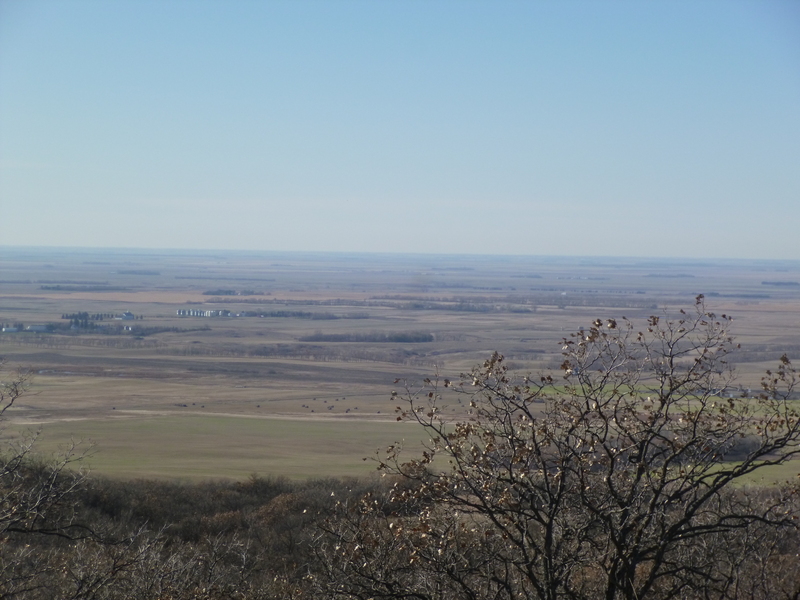 Compared to the surrounding flat prairie, I imagine any elevation change is notable, and there were numerous signs announcing the changing elevation, even though it only increased from 1700 feet to 2266 feet! 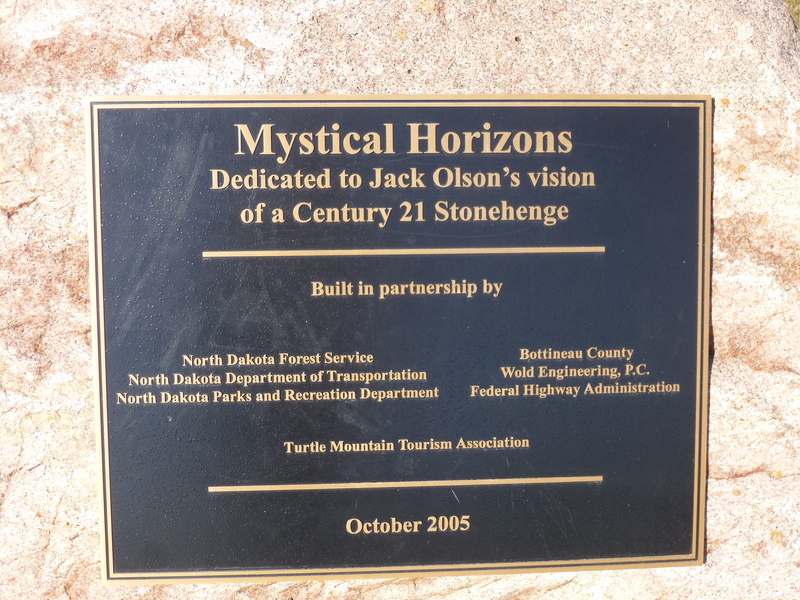 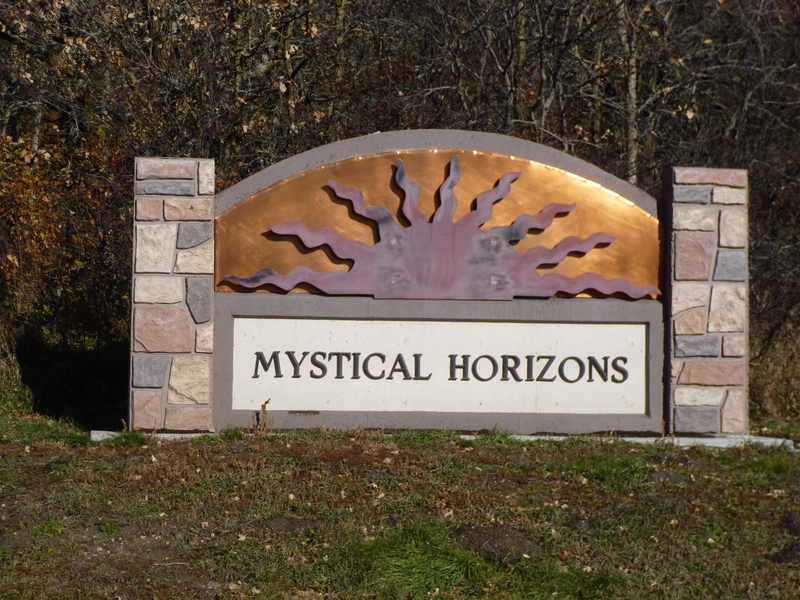 Along the way I made a quick stop at Mystic Horizons, which one guidebook said was a 21st-century Stonehenge. 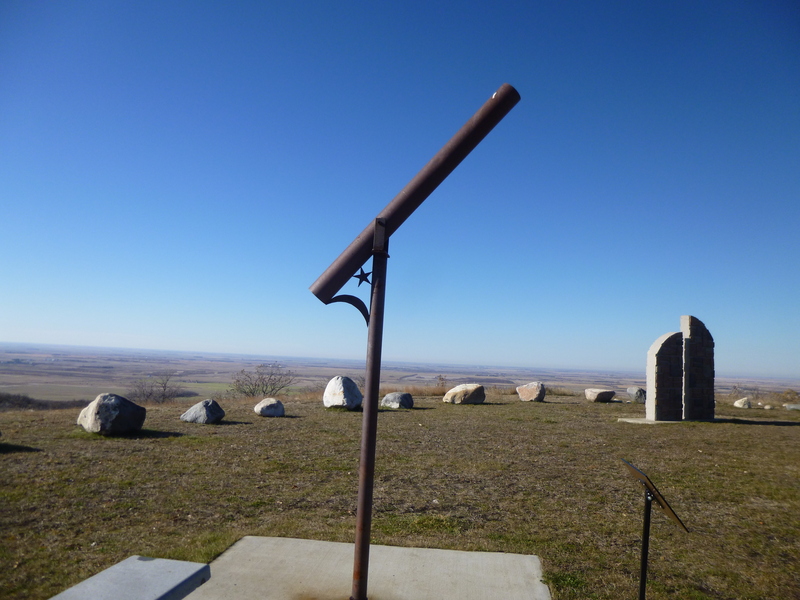 There were huge rocks set in place with little slits cut out of them where the sun would peek through at exactly the moments of summer and winter solstice, and spring and fall equinoxes. 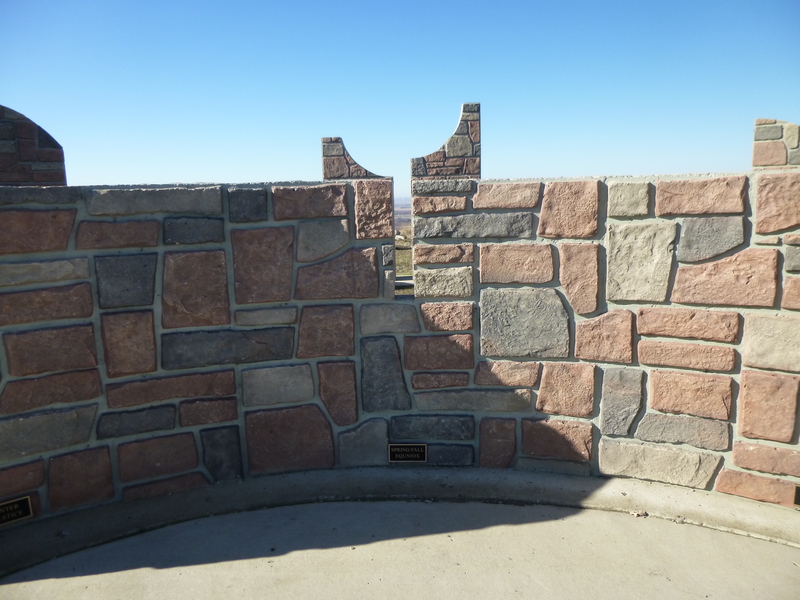 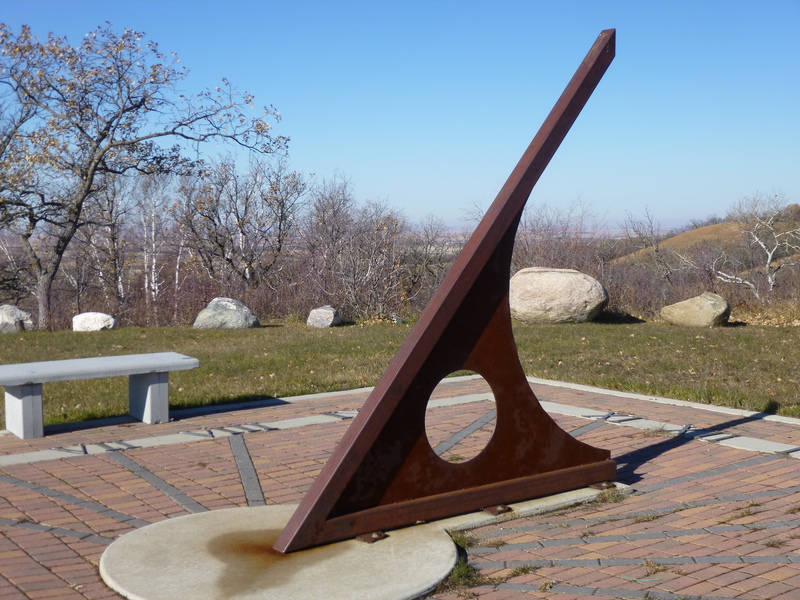 There was a large sun dial, and a Polaris Sighting Tube to locate the North Star. 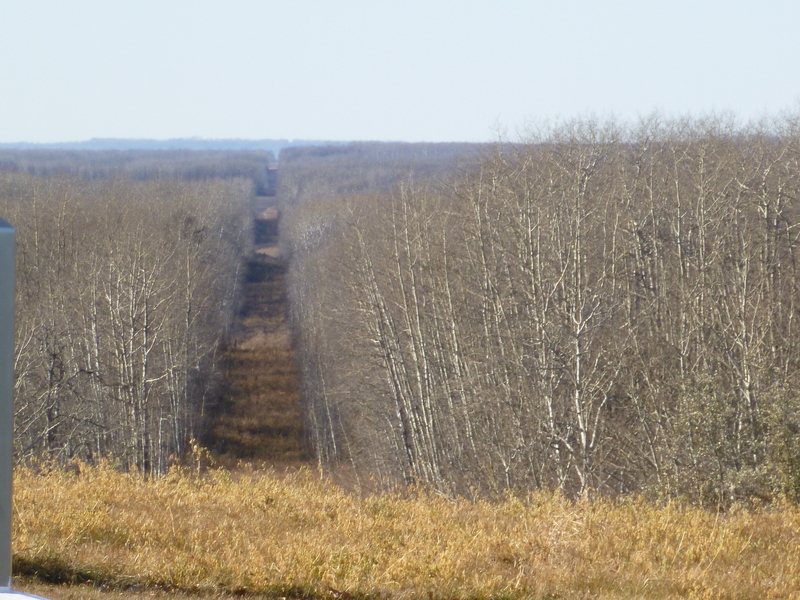 And there was a nice view of the prairies stretching off into the horizon. 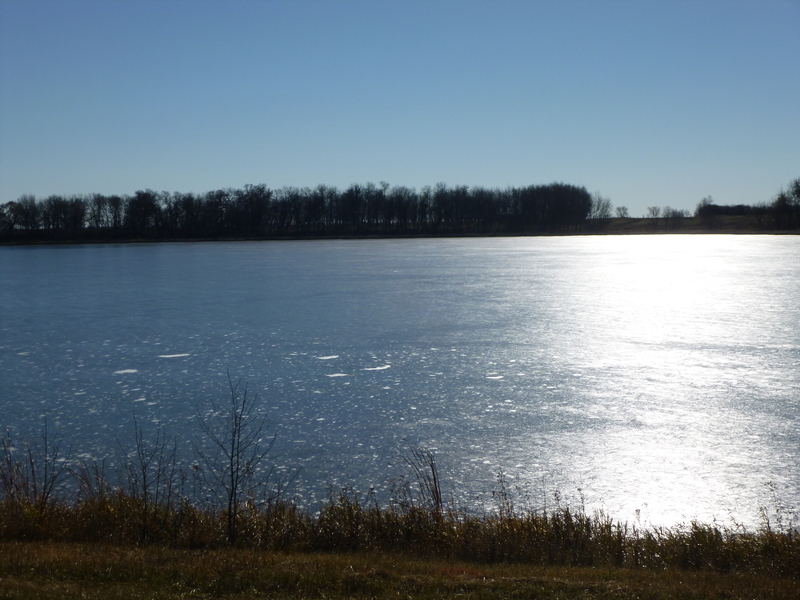 I drove east along the North Dakota/Canada border, passing cows turned loose into old cornfields, and lots of small frozen lakes. 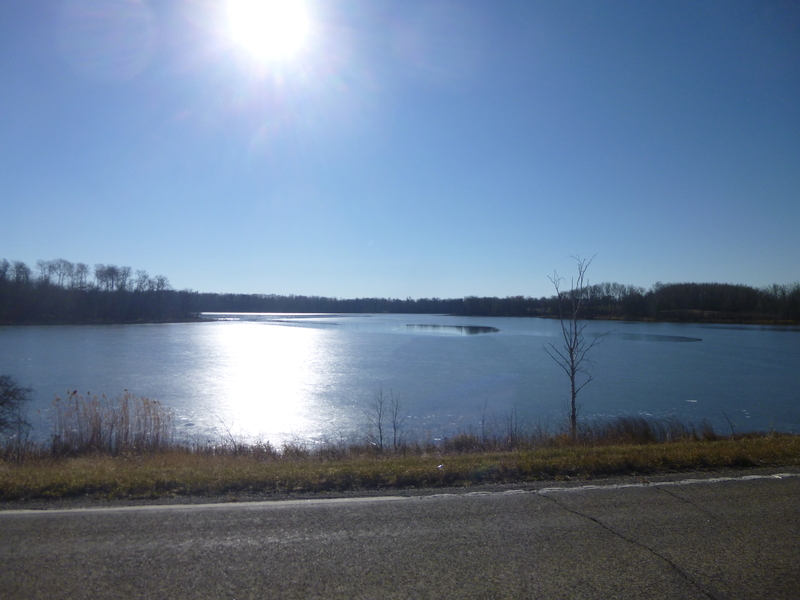 It was a sunny day, but pretty chilly. 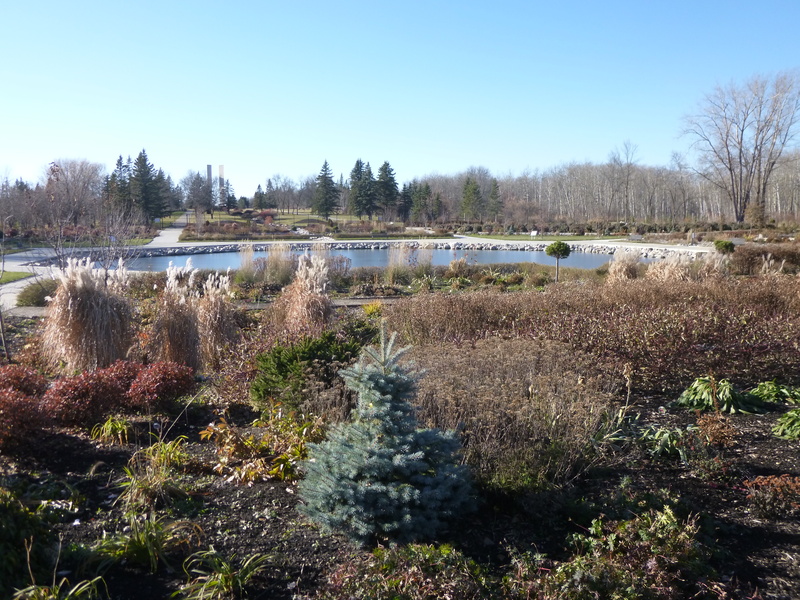 Then I arrived at The International Peace Gardens. 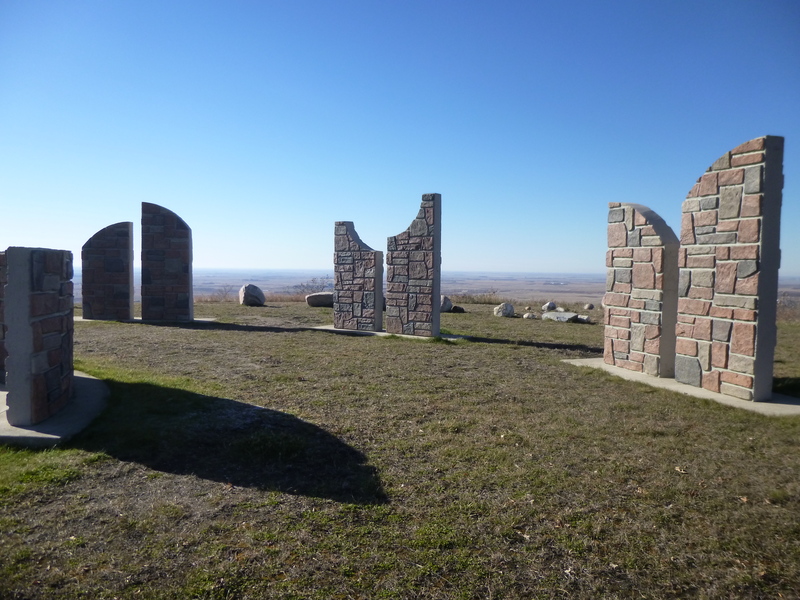 The flowers were no longer in bloom of course, but it was still a good place to get out and walk around, although I stayed on the North Dakota side. 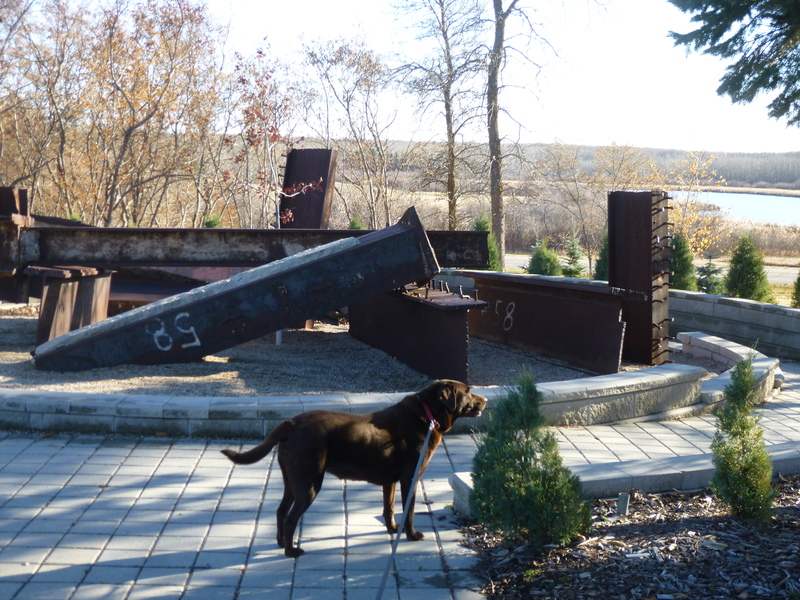 I walked 3 1/2 miles around the Peace Gardens loop, and then Tula and I walked another mile through what was left of the formal gardens, and by the big floral clock. 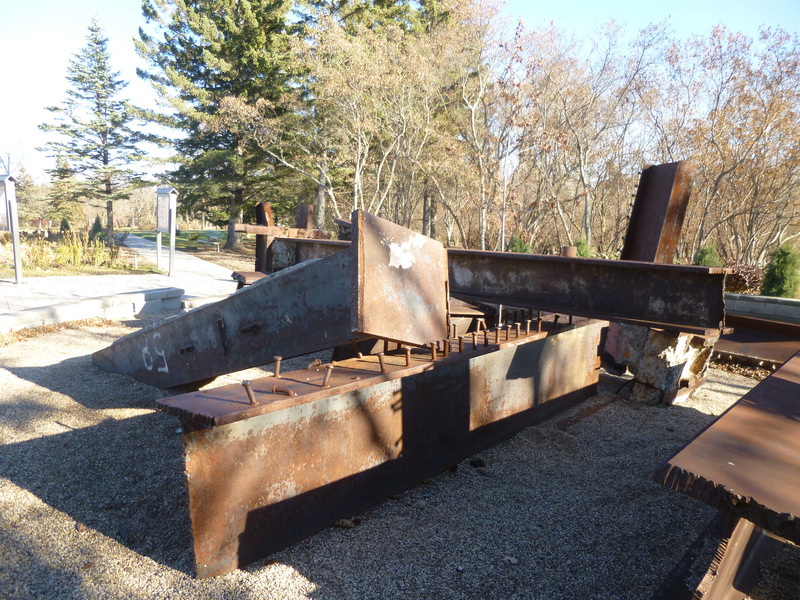 There was also an unexpected 9-11 tribute, with a monument made of some of the fallen steel beams from the World Trade Towers. 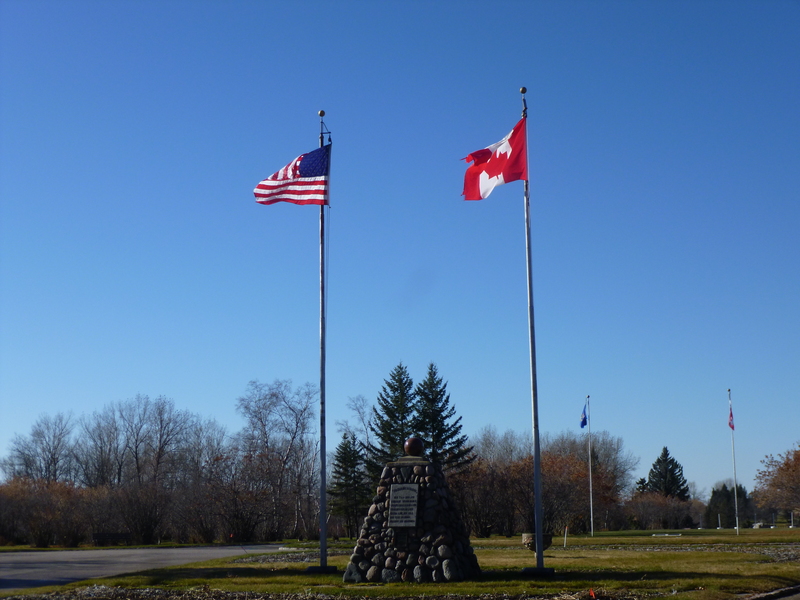 Outside the boundaries of the Peace Gardens, the actual border between the US and Canada was a very straight line of dirt where trees had been cut down to make a border line – my Triple A book says that the Peace Gardens commemorate the friendship between the US and Canada on the longest unfortified border in the world. 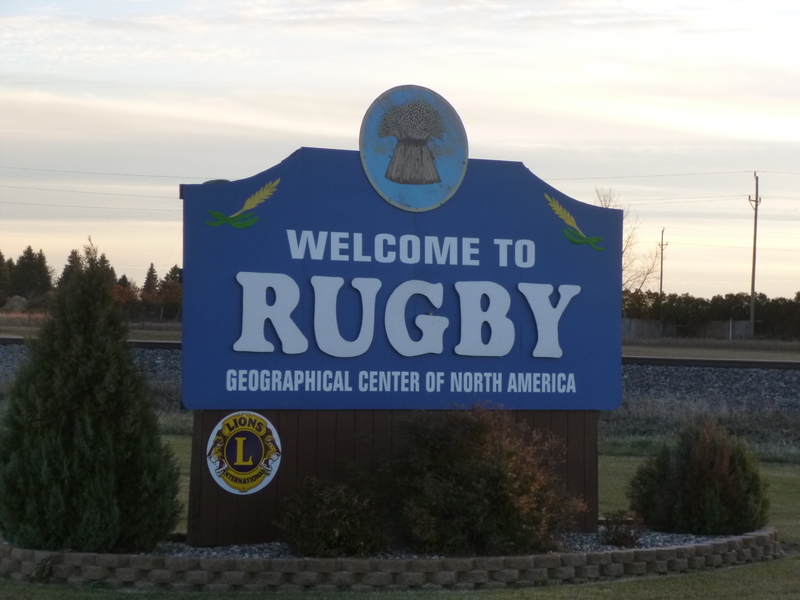 I had to go through Canadian immigration/customs on the way out and then I began to head south to the town of Rugby, which is called the Geographical Center of North America. 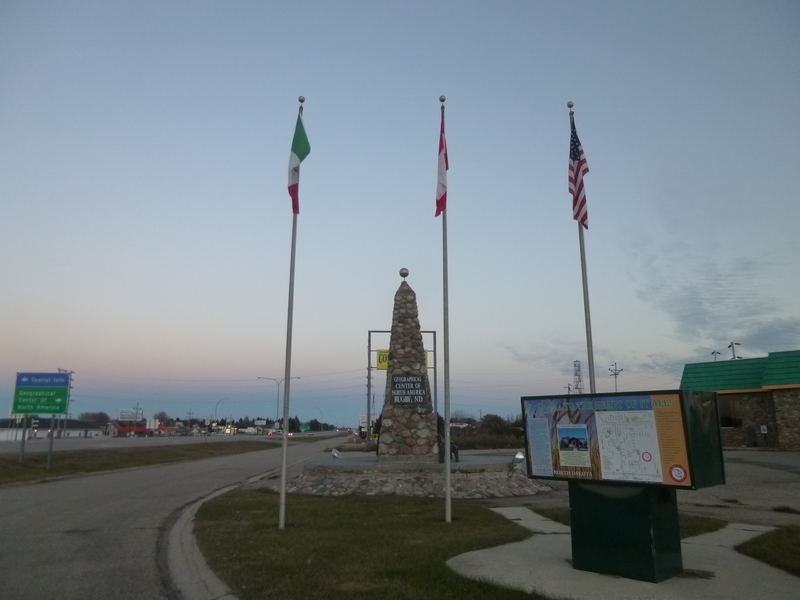 I found the stone marker, which had the flags of the US, Canada and Mexico all flying by it. 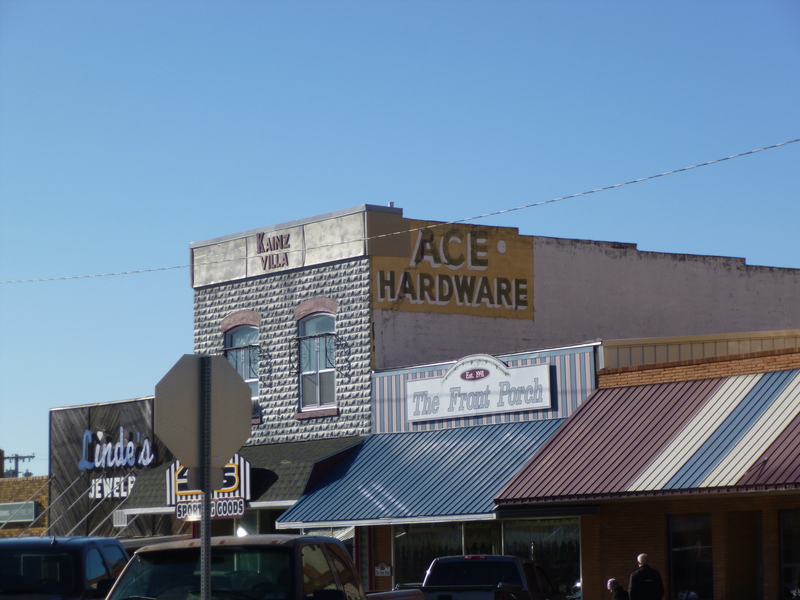 Then I walked a couple miles throughout the town of Rugby, and passed a unique bell tower, and an old-style movie theatre which seemed to only be open on Saturdays, and a lot of people were coming out for the movie. 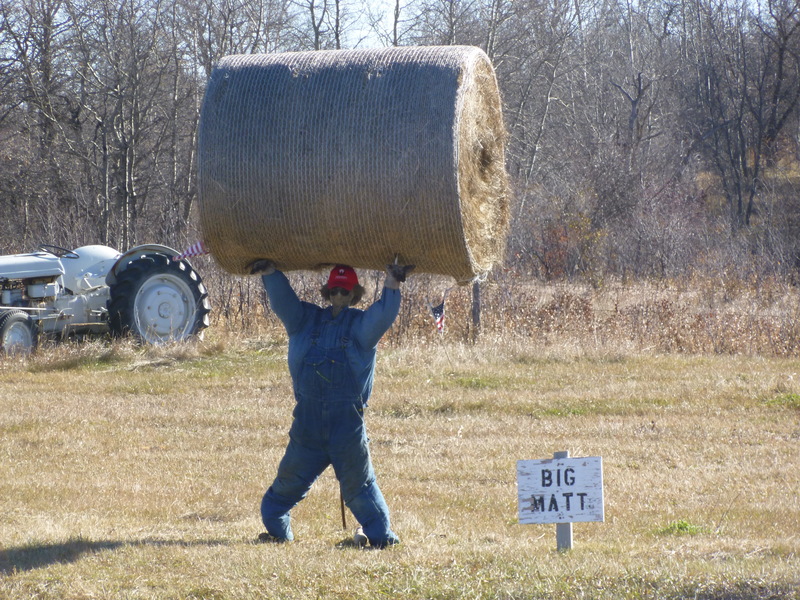 Since I had made 2 donations yesterday, I didn’t make one today. 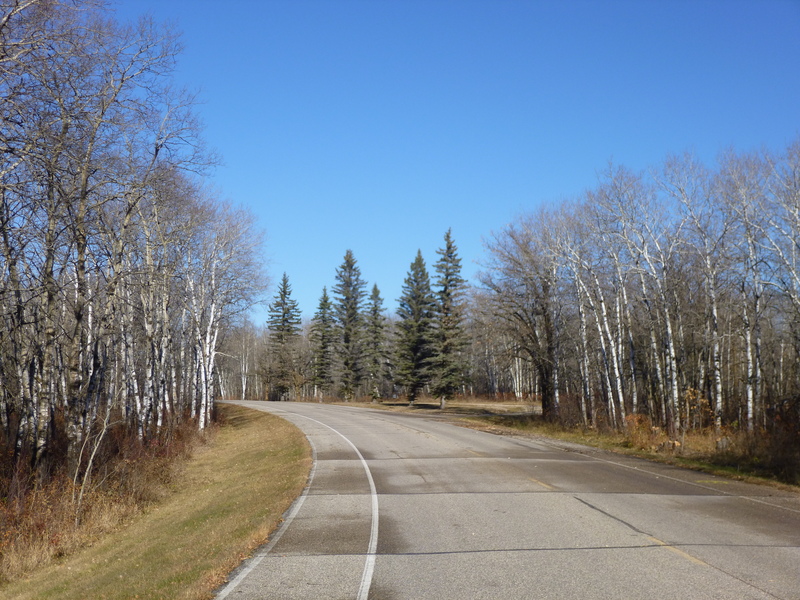 Once my walking was finished, I drove another hour or so over to Devils Lake where I stopped for the night, and enjoyed a good meal at Applebee’s using a gift card.